Elliot Brindle is a bright, meek salesman, drowning in debt – and desperate as he’s about to marry the love of his life. Upon receiving a phone call informing him that he’s on a hidden camera game show where he must execute 13 tasks to receive a sum total cash prize of $6.2M, Elliot dismissively follows through with his first two instructions: swat the fly that is currently bothering him, then eat the fly. With thousands of dollars suddenly appearing in his bank account, Elliot remains skeptical, though comforted by the knowledge that he can stop playing at anytime if only to lose every penny that he’s won. Trapped into the horrors manipulated by unseen spectators, Elliot’s need to complete the game escalates as the tasks grow more extreme, to a devastating point of no return. What would you do? You’re sitting in your car, looking blankly around while waiting at a traffic light. You slowly begin to realize that your world is falling apart with you standing in the epicenter. Your dream to climb to a better position in the company where you work, was nipped in the bud by a sudden resignation because you are not enough ruthless and unfeeling. Your wife is pregnant and you’re about to get married. You also have to take care of your mentally handicapped brother, which costs a lot of money. You have outstanding debts from your studies. And as icing on the cake, your aging “racist” father wants to move in with you. You come to the realization that your life is going to be a hell, since your future wife is an Afro-American. And then suddenly you get a phone call from someone, telling you that you have been selected to participate in a simple game where you have to finish 13 tasks so you’ll receive a lousy 6.2 million dollars. The first task for $ 1,000 is to swat a fly that’s flying around in your car. I wouldn’t think about it for one second and smash that damn fly untill it’s as flat as a pancake. And so did Elliot (Mark Webber). As a result he sees his bank account filled with the promised sum of money. “13 Sins” is a horrifying thriller. You can see it coming that the following tasks aren’t that obvious, but rather insane and they put Elliot all the time in a dilemma. Because if he doesn’t perform the job, or explains the whole thing to someone or deliberately tries to sabotage the game, he’s automatically disqualified and he loses the laboriously saved up money. This movie is based on the popular Thai film made ​​in 2006 by Chookiat Sakweerakul. Granted I haven’t seen the original film, and probably there will be a multitude of supporters shouting loudly that this is an abomination of the original superb film. I have no idea if that’s true, but I thought this was a decent film, full of suspense and entertainment. Elliot is being confronted with the phenomenon of human weakness. He realizes that what he’s doing isn’t socially acceptable and yet he overcomes his distaste and disgust about his actions, because the goal in the end is so promising . Mark Webber (“Goodbye World“) succeeds in showing those mixed feelings perfectly. You see his alter ego evolve from excited and enthusiastic, to disgusted and pronounced outraged. For me this was a great interpretation. He also has a certain charisma that makes you feel directly involved with his sad situation and he immediately arouses sympathy. Devon Graye also convinces as Michael, the mentally handicapped brother. At times it’s terrifyingly real. A chatterbox who must take his pill on time and has fixed rituals like driving at a certain speed on a main road. To the annoyance of other road users. Rutina Wesley is for the most part just an insignificant side character. Until the end. Then there’s a defining moment in which the whole process could well restart. Looking at it afterwards, this is actually the key moment in the whole film. Ron Perlman, the chameleon in the film world, better known as “Hellboy“, fits perfectly into the role of the dubious detective Chilcoat. His oversized chin alone, makes an overwhelming impression. The moment Chilcoat starts showing interest in the matter, leads to a rapidly succession of twists and finally ending up in a totally insane finish. The rapid pace at which the film is set, and the succession of lurid scenes, makes sure you can’t think about the sense and nonsense of the whole thing. 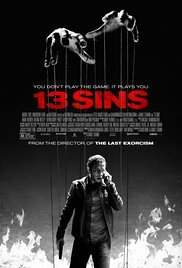 “13 Sins” isn’t really a horror but rather a tight “to the point” thriller involving topics such as materialism and judgments, in an elevated manner, about the fate of others. A successful concept with occasional gore sections which were well appreciated.